← Google Adsense: why should you consider it? Sustainable Business Strategies for SMEs in a "dying industry"? I often encounter the phrase “Print is dead”. Of course, print is not dead. First of all, it’s not a living organism – so technically unable to die because it never actually lived. Second, I still meet printed collateral on a daily basis. Third: history demonstrates that some people always tend to state that new emerging media “kill” existing ones. Concerning this third issue, allow me to have a small digression by referring to the panic for the medium radio with the rise of commercial television. Commercial television would kill “the radio”. In fact, radio still exists. What happened is a re-allocation of the time spent for a specific medium. People tend to watch more tv and listen to the radio less. But radio is still alive and kicking. People just use it in a different way. The radio went from a “primetime” medium to a “drive time” medium – which means that people mainly use radio while driving a car. So: did video kill the radio star? No, it did not. It just resulted in a new way of allocating resources for specific media. How to understand the phrase “print is dead”? So one needs to pay attention what exactly is meant and how the above phrase should be understood. First of all, we have explained in the above paragraphs that media do not die. However, having a look at the phrase “print is dead”, there seems to occur another problem. What is the “printing industry”? The printing industry is a rather general description of business activities related to printing. The argument that print is dead doesn’t hold much water past books, newspapers and magazine – which aren’t even dead also by the way. The printing industry has multiple subsections, so one cannot simplify that easily. To start with: every single item made and sold in this world comes with packaging, even if ordered over the internet. So package printing won’t die. However, in times of economic downfall people consume less, which results in less shipments of goods (with printed packages). 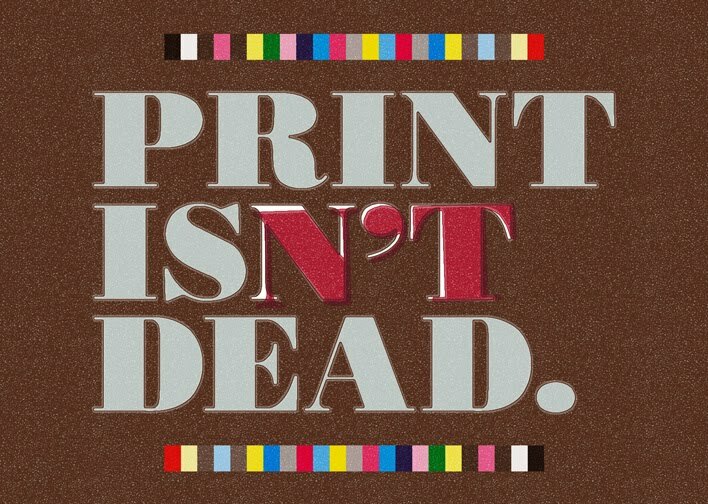 This also counts for commercial printing – which most of the time people denote when saying the phrase “print is dead”. Commercial printing is about the creation of leaflets, brochures, catalogues, etc. Yes, it still exists and it’s often quite important to have those “sales support documents” next to a powerful website. What is a fact is that more and more corporations are re-allocating their budgets from print to other media (internet, mobile, tv, …). But it is not dead. Nevertheless, the decrease in volume of printed marketing collateral has been an undeniable trend for years now. Companies that have been in the industry for years are increasingly looking to survive. What business strategies have proven to be effective in surviving this turmoil? Sustainable business strategies for commercial printers? 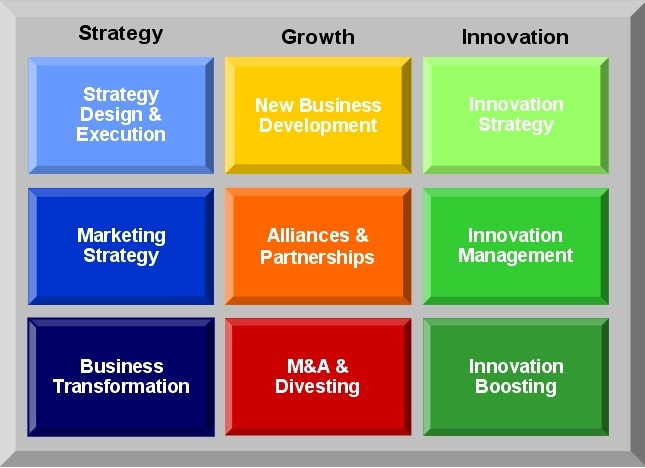 We don’t want to put an in-depth (theoretical) analysis here about business strategies for growth and innovation. But apparently they are closely linked to one another. The image on the left should do the trick for now. We believe it’s more fruitful to draw a real-life business case. Sustainable business strategies for SMEs in commercial printing? The graphics / printing industry has been going down for years now. The economic slowdown and the credit crunch only empower the trend. Loads of SME printers went bankrupt or at least had to shrink down the number of employees. As a reaction, the industry’s major players reached out to a well-known strategy for growth: “M&A” (mergers and acquisitions). A financially strong company within the sector buys out less powerful players and consequently integrates them into the new structure. The sustainability and growth of the business is hence secured (it might be a short-term…). As a result of the concentration process, the number of printers within the industry decreased. SMEs reacted by expanding into multi-media production services or by integrating into larger corporations. However more creative initiatives have seen the light as well. And those initiatives don’t even mean the loss of SME commercial printers. The initiative “Pinca” of the Pica Media Partners Group is one of those creative initiatives to counter-fight the negative spiral of the industry. Pica Media Partners is an independent network that contains more than 30 graphic communication corporations within it. The network covers the entire area of The Netherlands. By gathering the strengths of each entity in a network, the group has additional forces for marketing, sales and purchase. By uniting forces, the SME companies within the network can benefit from the state-of-the-art tools as if they were a big player. In today’s printing industry it’s important to make the transition from a “printer” who sells products into a “media service provider” who sells services. An important element to successfully realize this transition is technology. Specific technologies support printers’ transformation into a service provider. The network equally saw the importance of technology and jointly invested in an “online collaboration platform”. We are very keen to see how this technology will further prove how business model innovation can act as a strategy for growth. And I have to say: it looks quite promising. The deployment of the technology resulted in an innovative business model within the graphic production industry. In fact, BMI or business model innovation could well be the theme for my next blog post since I started to feel a particular interest in related subjects. One Response to Sustainable Business Strategies for SMEs in a "dying industry"?